Looking for a less permanent solution? Rent our curved walls – we’ll supply and fit it, then collect it after your event. We’re experts in the installation and hire of temporary walling for applications like exhibition stand walls, trade show booths, temporary art galleries, screenings, room creation, and a whole lot more. All our curved wall panels interlock to create continuous solid walls and/or booths. You can screw, pin or stick to the wall panels and we can also provide plasma wall panels, which you can attach a 32″ to 50″ plasma screen on allowing for more floor space on your stand. What Are Temporary Curved Walls? Curved wall panels can be integrated with other temporary walling on event and exhibition stands to add curves or create feature walls. They’re 2.4m in height and can also be used to create columns and pillars which we can then illuminate or brand with your company’s logo. These walls are popular for use at graduation shows, art galleries and more, as they enable users to display TV screens, artwork and more. The walls are ideal for simply cordoning off areas you don’t want your clients to see. Once you’ve decided on your preferred layout, give us a call and our customer service team will be happy to help you figure out your final layout. 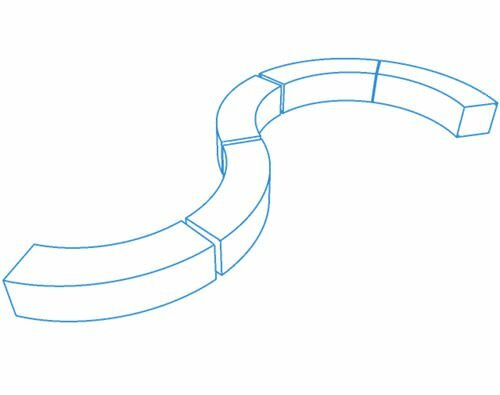 Where Can I Use Temporary Curved Walls? You can use them for art displays, exhibitions, marquees, offices, classrooms, university departments, room sets, warehousing, retailing and catering. They’re effortless and quick to fit and create a permanent or temporary space. Hire a single exhibition screen or a multi-joined temporary wall – they’re wonderful for any layout you need. We manufacture our panels, so if we don’t have what you need in our warehouse, we’ll simply create them to your liking. We offer lighting with our walls and will be more than happy to help advise on this as well as potential wall layouts. We’ve supplied panels and temporary walling to exhibitors and numerous key events in addition to walls for smaller private functions. Have You Seen Our Other Temporary Walling Solutions? Aside from curved walling, we provide a whole host of other walling solutions, including exhibition walling, art display walls, slatwalls, exhibition stands, low walls, plasma panel hire and much more. If you’re looking for temporary flooring hire of exhibition carpets, look no further than our temporary flooring section where you’ll find a huge assortment of items in a range of colours and finishes. We offer a full delivery, installation and removal service, the costs depend on how many panels you hire and the location. You are also welcome to collect our panels and set the up your self.